Some days, the Gods smile on you. Tuesday, December 1, 2009, was one of those days for me. When I came home from Thanksgiving weekend there was a FedEx envelope on my front porch. In it was the December issue of Food Arts, which contained my Silver Spoon Award. The profile was written by my friend, the great chef-restaurateur-television personality-and expert on Spanish cuisine, José Andrés, whose new restaurant Bazaar has taken Los Angeles by storm. I am very grateful to José for his kinds words in this supremely gratifying piece and to Michael and Ariane Batterberry, founders and publishers of Food Arts, and to my editor Jim Poris, who selected me for this prestigious award and got José to write it. "Spain wouldn't be as known to Americans without the stories Gerry tells and writes." "As a young chef arriving in America from Spain in the early 1990s, I came to see Gerry as an ally. At the time, I found myself struggling to explain Spanish cooking because people either had no idea or they had the wrong idea. It was a battle. But Gerry's writing meant I was not alone in telling Americans about piquillos and escudella and jamón. 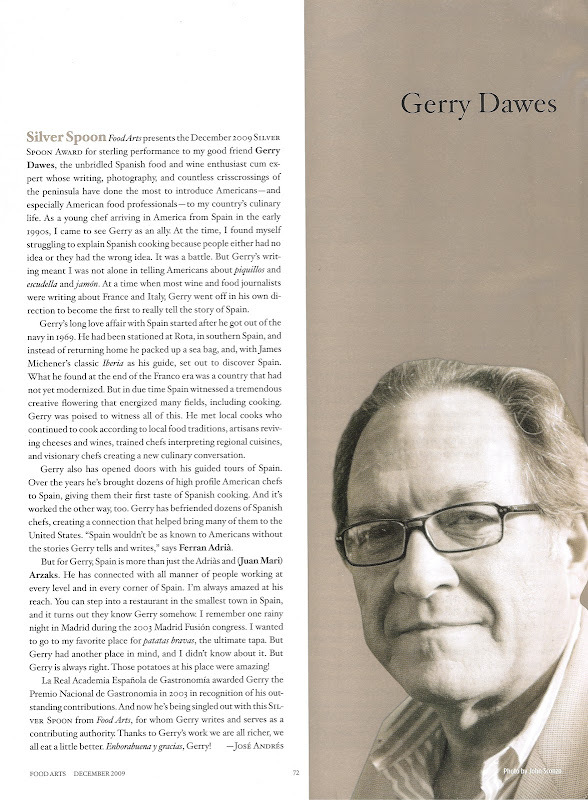 At a time when most food journalists were writing about France and Italy, Gerry went off in his own direction to become to first to really tell the story of Spain." Like I said, some days the Gods smile on you and when the culinary Gods smile on you that is some great day indeed. For many years I have lived believing that the greatest day of my life is still ahead of me, not behind me. Receiving the Silver Spoon Award made this one of my greatest days and it also re-affirmed that the best day of all is still ahead. I just opened up this month's FOODARTS! mouth! Oh my god do you deserve this! he gave you permission! Let's celebrate. Now.....I will read the story. Just saw the Food Arts Silver Spoon. Abrazos Amigo! !